Bio Pure, the water treatment brand of Elken, launches Bio Pure Ultra, the latest water treatment system which aims to provide clean and safe water for a healthier life. 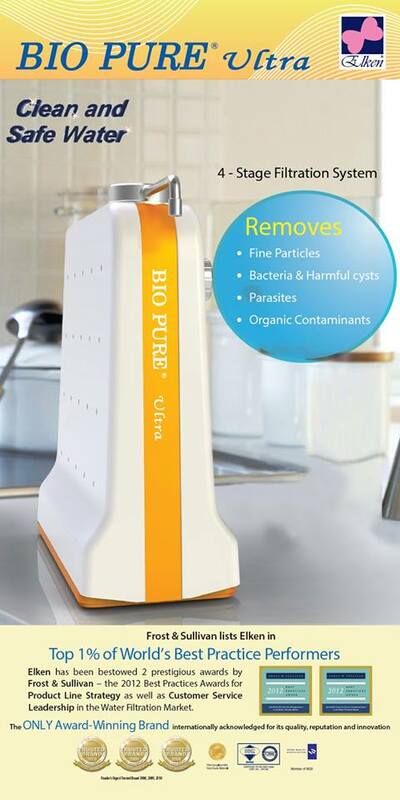 The new Bio Pure Ultra water treatment system features a 4-stage filtration system that filters fine particles, bacteria, harmful cysts, parasites and organic chemical contaminants. The filter technology used in the Bio Pure Ultra is a membrane filtration system where hydrostatic pressure forces tap water which could contain bacteria, pesticides, sediments, or other contaminants against a semi-permeable membrane for a great tasting safe water. “Water is the building block to good health,” said Michael R. Long, Product and Research Director for Elken. “We are constantly exposed to internal and external factors that dehydrate us, be it from our environment, stress or an unhealthy lifestyle. Having clean drinking water is one of the fundamental steps in ensuring we stay healthy,” he added. With four stages of filtration, the stylish and compact design of the Bio Pure Ultra ensures clean and safe drinking water for your family straight from the tap. First stage of the filtration includes a sediment filter which filters particulate contaminants down to 1 micron in size. The second stage includes a organic granular activated carbon pre-filter which removes virtually all organic chemicals. Third is the Ultra filter which is used to remove bacteria, cysts, microscopic worms, parasites, and other organisms in addition to removing particles down to 0.1 microns in size. The fourth and final stage includes an organic granular activated carbon post-filter which deodorizes and polishes the water to improve its taste. “The Bio Pure Ultra is another one of Elken’s excellent products in its range of superior water treatment systems. It makes tap water clean and safe so that you and your family can drink great water,” said Michael. For more information and inquiries, contact the Elken customer service hotline at +63 905 212 5908, or email them at customerservice@elken.com. 1 comment on "Elken Philippines Launches Biopure Ultra"